Terrible One have re-released their T1 Pegs once again! What do you think? Do you have any comments? Let us know what you think in the comments below! Now this is RAD! The guys at Terrible One put together this flipbook looking back at the history of the different Ruben Alcantara frames they have released over the years, with a ton of interesting facts and details you might not have known! This covers a lot of ground and will definitely remind a few of you mid school guys of things. Give it a flip through and take a peek. You won’t be disappointed! The annual pre-order for the ever popular Barcode frame has started! It’s that time of the year again! Joe Rich has just announced that he is starting to take the 2017 Barcode pre-orders from you guys. As many of you know, this is the one time of the year you can guarantee that you will be getting a frame since most of these frames end up being pre-sold or sell out real quick if a shop or mail-order ends up getting a few. As always, you get your choice at 4 colors (Raw Gloss Clear, Black, Forest Green, Dark Burgundy are this years colors), top tube size (20.75″, 21″, 21.25″ and 21.50″) and brake mount options (welded on seat stay mounts and guides, removable chainstay mounts and guides or no mounts). 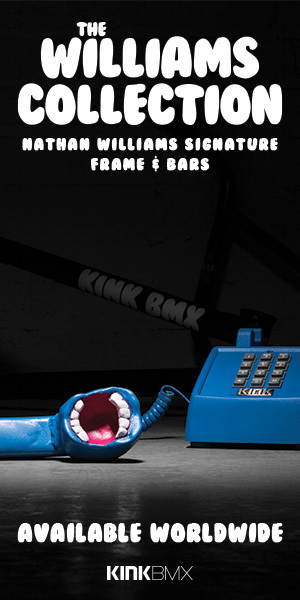 The frames cost $395.00 + shipping and require $200.00 down on all pre-orders. Get the full details on the 2017 Barcode Pre-Orders on the Terrible One Website or hit up Info@terribleone.com! You know you love a good old fashioned Head Tube Badge! The guys at Terrible One have just re-released two of their head tube badges and introduced a new one on top of that! They’re available as a Polished Original, Brushed Original and the new Polished T-1 for $25 a pop and can be ordered from the Terrible One webstore. These badges are hand made down in Australia and is a great accent piece to add to your Terrible One setup. Note, if you’re outside of the United States, please email info@terribleone.com for shipping rates! These head tube badges are limited edition, so if you’re trying to get your hands on one, you’ll want to get on this today. Do you love head tube badges? Check out The Art of the Head Tube Badge where we take a look at a whole bunch of different badges from BMX brands. The crew at Terrible One released a new Bike Check with Russell Brindley and his current SFA setup that he’s running down in Australia. The flipbook below has a whole bunch of photos giving you a good look at the bike, along with a full parts like! 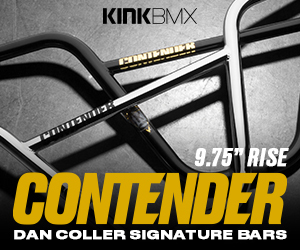 This BMX bike is built for speed and style! Take a look and make sure you go full screen to get a good look at it! Yesterday we got the first look at the new Terrible One Skapegoat Frame that is due out at the end of this summer! Now today we get a fresh Bike Check with Shawn “Elf” Walters and his current setup with a prototype of the frame! You can check out a full parts list and a bunch of photos over on the Terrible One Facebook Page! You can get full specs and details on the Terrible One Skapegoat Frame here!